A new offering on Sainsbury's shelf this week was Cadbury's Dairy Milk Ritz, retailing at £1.50. Since Hershy took over the Cadbury company, Dairy Milk has been combined with a number of American brands, which has seen the likes of bars such as Dairy Milk Oreo. Now another biscuit has come to join in the act. Ritz are salted savoury crackers usually served with cheese, so it is an unusual combination. I could see it working with dark chocolate, but milk? Another question I have to ask is, is it a chocolate bar or is it a chocolate biscuit? From the packaging, I initially thought the former, as it appeared to be presented in the same format as all their other bars. When I opened the packet, however, it turned out that it was not one big bar, but several individually wrapped ones. 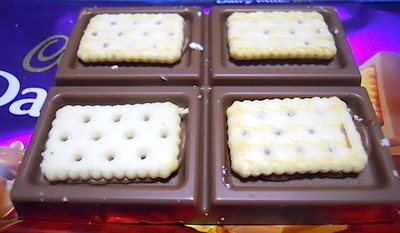 Rather than the chocolate coating the biscuits, two Ritz crackers sandwich the chocolate inside. It is not quite a chocolate bar, but the chocolate's thickness means it is not quite a biscuit either. But enough about semantics. What does it taste like? While salt integrated into chocolate works very well, having it as a separate element brought a unique difference. The mixture of savoury and sweet was a little confusing, and at first I was not sure I liked it, but once accustomed to it, the flavours and textures became quite pleasant. I'm not sure if I would buy it again, but it was definitely worth trying.